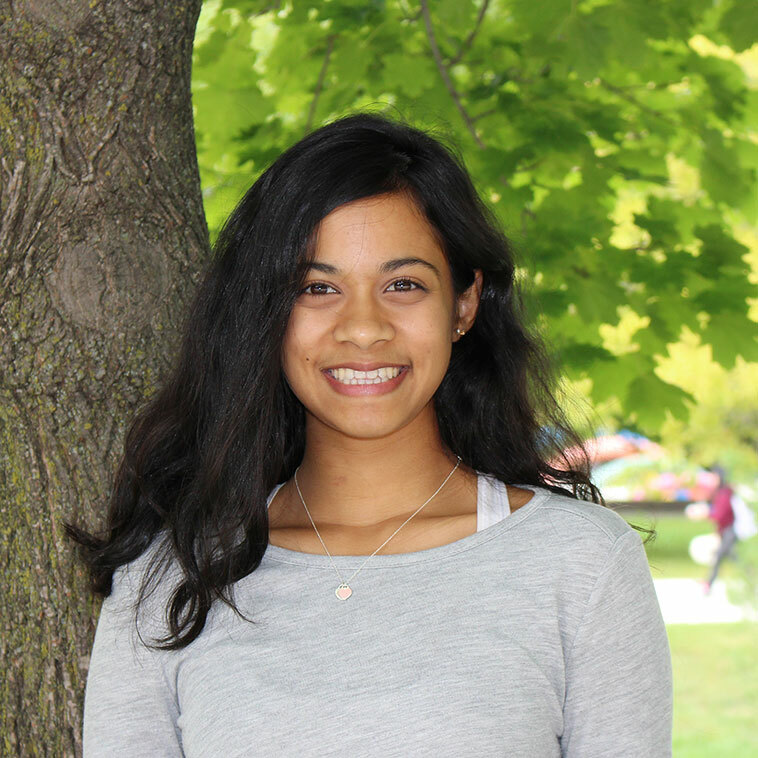 This post was written by Aliya during her 3rd year of the Environmental Management stream. In my first year of university, I often received emails from“official postings” about opportunities going on in the Faculty of Environmental Studies. These emails consisted of events taking place in the Faculty and volunteer, job, placement and experiential learning opportunities inside and outside of York. In my first year, I never really paid much attention to these e-mails because I never thought that I would be able to obtain any of the positions being listed and I was too afraid to attend events that I thought were so big (It turns out that they were only classroom sized). I have always had a passion for being outside: hiking, camping and enjoying nature. I love trees: learning about them and identifying them. Part of my passion for trees and forestry actually stems from the Intro to Environmental Science course assignment where we had to go outside in the Boyer woodlot and measure, mark and identify tree species. I thought it was so cool and it’s honestly something that I would do again just for the fun of it! Then there was that one hopeful day. The day where I opened an official postings e-mail looking for people interested in planting trees around Toronto. Being my excited self, I yelped, shared this with everyone I knew and applied right away. I didn’t expect a response until a couple days later, but heard back the next day. It had to be fate! 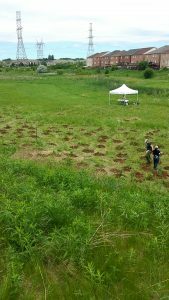 The organization affiliated with the tree planting events is run by City of Toronto staff (Toronto Forestry) who do research and events at Evergreen Brickworks located in the Don River Valley in Toronto. After back and forth e-mails, my interview, and training dates were set up, I finally got to outside and get planting! 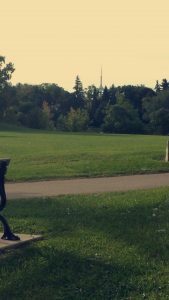 For someone who spends a lot of time in the suburbs of Vaughan, it was really nice to start venturing out in ravines and parks around the City of Toronto. The actual tree planting events are my favourite part of this whole experience. Depending on where we plant, there are usually 30 or more people who come out to plant trees in the community. I love seeing such eager people yearning to get out there and do something for the greater good. Every event I attend and assist with, I learn more about tree and plant species. Off the top of my head I can name you 10 invasive plant species in Ontario and 20 native tree species. I can tell you that you should never plant more than one Birch tree side by side because they are very competitive and one will try to kill the other! (I know, right, who knew trees could a have such an attitude?) The most amount of trees planted at an event I attended was 500! For only 3 hours of tree planting, I think planting 500 trees is a remarkable accomplishment. Not only do I get to physically plant trees and de-stress by being outside and with nature but I also get to share my acquired knowledge with members of the community by leading demonstrations on how to plant trees and speak about the species of trees and shrubs in which we plant. Lastly, I cannot speak anymore highly of the staff members at Toronto Forestry. They are the most dedicated, hardworking, knowledgeable and motivational spirits I have met! At every event, I’m told about the species that we plant, encouraged to lead demonstrations and am always recognized for the effort that I put in. The staff members are so kind and helpful that they even talk to me about the career paths in the field and how they found their positions. Speaking to them about my career goals and my area of study has motivated me to keep doing what I’m doing because there has never been a more pressing time to be an environmentally active and an engaged citizen in my community. To this day, I still volunteer with Toronto Forestry planting trees around the city and learning more and more about urban forestry and the ecosystems that are very important to the interconnectedness of our biodiverse city. Volunteering with the City of Toronto is hands down one of the best things I have done in my educational career and I encourage anyone who is interested in getting outside and making a difference to plant trees because its has such a long lasting impact on me and the way I view the environment. And to any prospective Environmental Studies student, I encourage you to look at all the official postings e-mails that are sent. While there may be many e-mails and all of them may not meet your taste, at least taking the time to look at the subject line might be worth it, because it certainly was for me.